Scribbles from a midnight diary: Dr. Phil in the O.C. 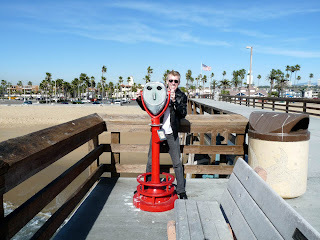 Yep, this week I headed down for a trip to the O.C., otherwise known as Orange County. 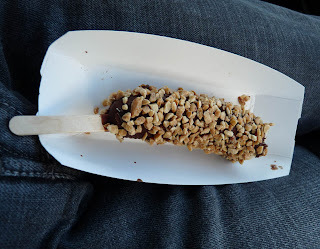 I wanted to see what all the fuss was about and try some of those famous frozen bananas (more about them later). Secretly I hoped to see some of the pretty people who are pretty messed up. For those peeps who are not cool enough to know, Orange County is just south of L.A. County. 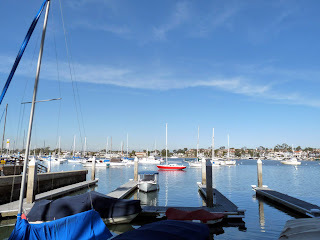 It is the home of such cities as Laguna Beach, Newport Beach, Anaheim and Irvine. It was founded in March 11, 1889 and is 948 sq miles. For more information, please refer to Wikipedia, like I just did. 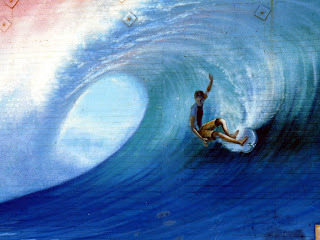 Of course, there is lots of surfing. And even some stupid looking tourists. Wait a second! That's me! I have a big smile which sometimes makes me look like a monkey. But don't you like those aviator sunglasses? I bet some people thought that I was a really cool local. 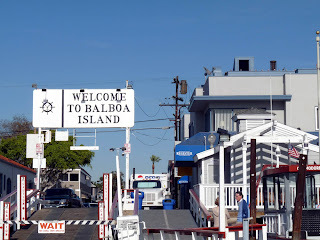 For added excitement, you can take a ferry with your own car over to Balboa Island. And once you are over to the island, you can partake in the local speciality. FROZEN BANANAS! If you are a fan of the tv show Arrested Development, you will remember that the Bluths had a frozen banana stand on Balboa pier. I was reluctant to buy one because they really didn't sound appealing but in the end, I was FORCED to get one. Coincidentally enough, mine tasted exactly like a frozen banana dipped in chocolate and covered with nuts. Here is a picture of my frozen banana. I know it doesn't look that impressive but c'mon it was very cold. I'm sure they taste a lot better in the summer.